Lyric was more than a rock star romance. It was filled with passion and drama and a mystery I kept turning pages feverishly to figure out. Just when I thought oh yeah it’s him well I was sadly wrong. I honestly love that in a book. Libby is in love with Maxon. They have known each other since they were 15 but her life isn’t conducive to his lifestyle. She has secrets as deep as the ocean and she believes if she keeps Max at a distance he will be safe from her family and all that it entails. When Maxon comes crashing back into her life with the promise of staying she gives it a try. Sadly life doesn’t always work out that way. Maxon has always loved Libby a woman he calls his rebel. His band has made it big. Clawing their way out of their dire upbringing he has never given up on Rebel. He comes home to make this girl his in every way only to find her acting strangely and unlike the girl he loves. When secrets come to light he does all he can to hold on and what a wild ride it is. I will admit I didn’t read nor did I know that this was a spin off of another series so I had no previous knowledge of any of these characters. I didn’t feel it distracted me from the story though. Sure it would have been nice to have some background information but it was fine to read as it is. I loved that this book had heart underneath all the who done it. I admit I’m going to eyeball my polaroid camera rather oddly now. Creepy!!!!! I just wish Libby would have had more faith in Maxon but I guess that was the point of keeping him safe. That darn contract!! I mean seriously?? 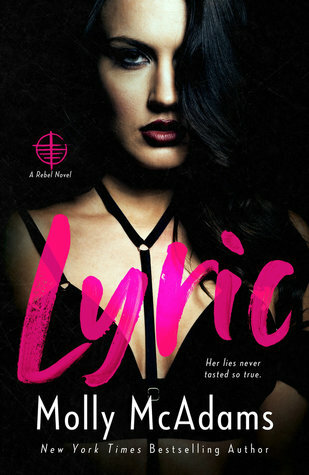 I will definitely read the books that Lyric was a spin off from.